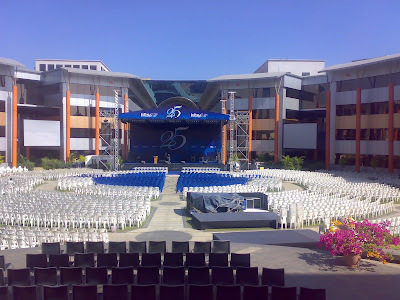 Have You known what is known as Majestic , magnificient , the perfectionist , if not one should have been present in Bangalore last year when Infosys Technologies celebrated 25 years of it existence in this blood sucking world. The time span it not only grew , flourished, challenged the traditions, the world and came out a winner. And when it stands on threshold of another new era , all of it wanting to be conquered by the most daring , Infy has again come up to accept the challenge. Just look at the picture below , one of the rarest pictures of the fountain area , one night before the big night. The alignment of chairs so perfect , the stage so silent like waiting for the big storm. The emptiness in this pic will soon be flooded to an extent that there will be over 15ooo people cheering infosys in its 25 years of setting up an example. The next morning i saw the most beautifully trimmed and kept the shrubs and water so pure. Though it is same everyday like that but the day everything seemes so heart winning. Something you are tend to believe, though no natural beauty , the power man has over nature. In the pic below , nice fountains lined with palm trees sandwich between the buildings. 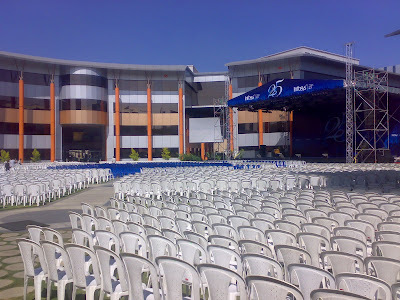 The view in the morning of the stage and the mystique lining of chairs in front of stage , leave a feeling like this is nothing but a quintessense of what Brand Infosys is. When it comes to something like quality or showing the might to the world , this senile quater century old company will no longer be a dessertation. It will be furor to wait out for what infosys has in store for the world. The number of employees expected to view this extravagent celebration of a company clicking birthday was expected to pass 15k , and so any place possible had seating available , keeping in mind the fulcrum of all the arrangemnts, the look and feel of the event not be effected. 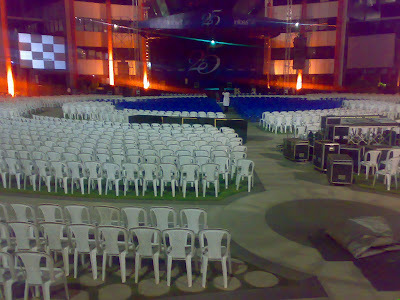 The number of chairs present in morning will beluge the person when he sees the actual crowd in the evening when Sonu Nigam comes and performs to one of his best performances. Sonu Nigam's performance with videos and pics will be appearing soon here . Please leave the comments by clicking Comments hyperlink at the end of this post. 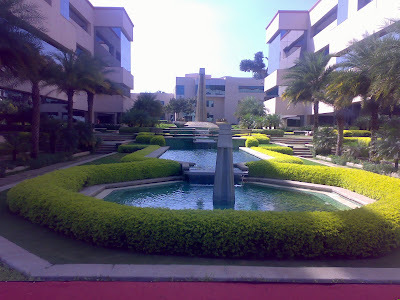 Bangalore , IT City , Software Hub and still most important and above of them all , main branch of Infosys Technologies Limited. I had heard from people while driving to Mysore to Bangalore on bike to leave my bike in Mysore , not because they doubt my biking skills but the beast called "Hosur Road" , little had a known there cud possibly ever be something so huge as traffic in Bangalore. I was reminded to days in Delhi when i was stranded in hours in traffic jams in evening school bus, but this one was much worse than that ever was. Buses , cars and bikes ... traffic all u can see , and a blade of free road is enough for a dozen vehicles fighting for it . Man, an admission to IIT must have been easy. And when it rains , it seems like someone has thrown gasoline over the already burning streets. an hour comes to couple and suddenly the bus travel stretches to like travelling on a highway ( only in terms of time spend). And this was proabably the only devil i found in Bangalore , as i used to tell my friends ... I was a carefree person , but after riding my bike for 5 months in Blore , i cud say with no regret .. "I believe life is a risk , myself have been doing it twice daily , once in morning and other while coming back from infosys to HSR". But apart from this , the Bangalore is bigger than a city. Its still better than the notorious bangalore as it is known. It is gem of a city , will give u all what u want. Though it comes with a price , still it is worth it. The locals are prevalant as in any other city, but one will not find it disturbing. If you have a localite friend then its great , but even if you dont have , you wont be stuck in Mysore where people deny to understand hindi and english, flat on the face. The auto will ask you some amount that will be so undesirable , come to Pune and you will know the current fare structure. People in bangalore are , i have not known many people in bangalore but a few ones , and believe me i will have a post on them coming in soon . 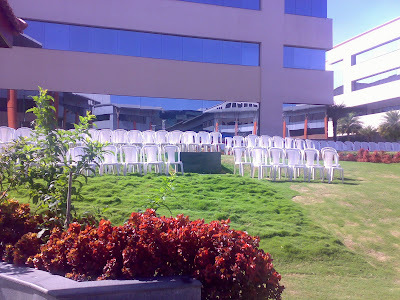 Now the above pic is of the time when i was in ECC , Infosys Bangalore but this was most travelled path. from my ECC to terminal ( food court). This day it was raining and it looked so beautiful. The pics were taken from my mobile in hurry and i did not want it to be spoilt as it was raining , hence blurred pics. And this is my favourite of Infosys bangalore , the colored misty fountain. just outside my building. Whatever it was , my stay in bangalore was one of the most memorable , not only because of varied options it provided but also because people i met here were good. Bangalore is far far a part of north india, and nothing but the deccan makes u believe u r in south India. Karnataka Express and two friends set the foot out to the outside world to chase the dreams, to make new friends , maintain old ones , and above all to earn money. Then also i had a different dimension to my dreams which i continue to nurture even today. When all the lines in each person is trying to deepen the luck line in the right hand , i have decided to take a different path. A path not only less travelled , but the one which will probably not reap any benifits for me , but might go down in memory lanes of so many people. This so innocent looking person has changed so much in last two years that even though God might not be able to tell the difference, i can sense the same. The pain of losing the friends , has infact took a step backward in making new ones. 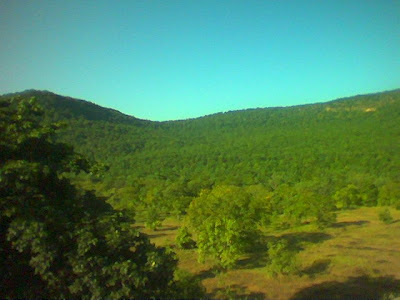 I still remember the josh i had when i left the place , to be in Bangalore and move to mysore. I saw so many things en-route , and there was me who believed that its best to outside home. Though that mentality has not changed too much , but still think that the friends who make will have a void in your hearts. 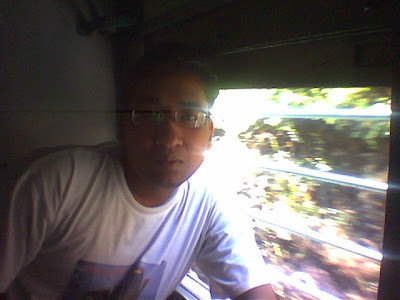 Now to the agenda of this post , those 42 hours in train , and the beautiful scenic beauties i saw in my life till then. 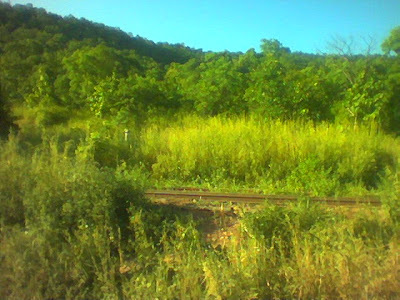 The pictures taken here are no match of what I have clicked in my mind, but i am sure one may be able to appreciate the beauty i saw in train. 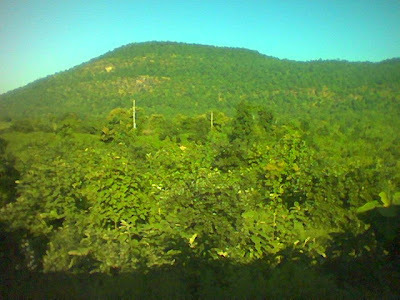 Above pic must seem to be a misfit in mist of scenic beauty but is not. 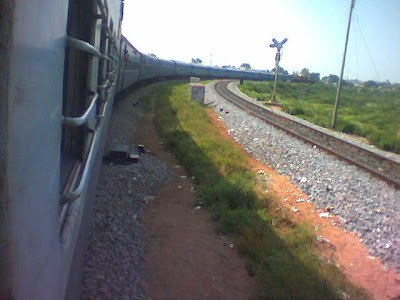 This is one the places where the train took a different line and track , so that other train ( rajdhani express ) can pass through and then over train took a reverse gear. Think we lost atleast 30 min there. 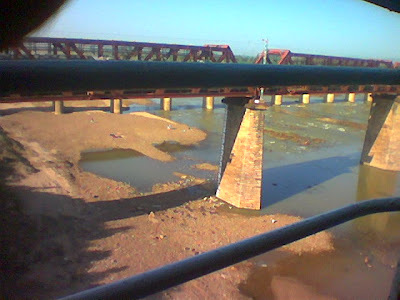 The above bridge was probably the longest bridge i crossed in my life, one can consider its length that i tool out my mobile, turned it on and click a pic , and this bridge was still going on. The bridge which is seen was previously used to commute over the river , but now the new bridge has taken over .. reminds me of the life , the old must go , and new must come.